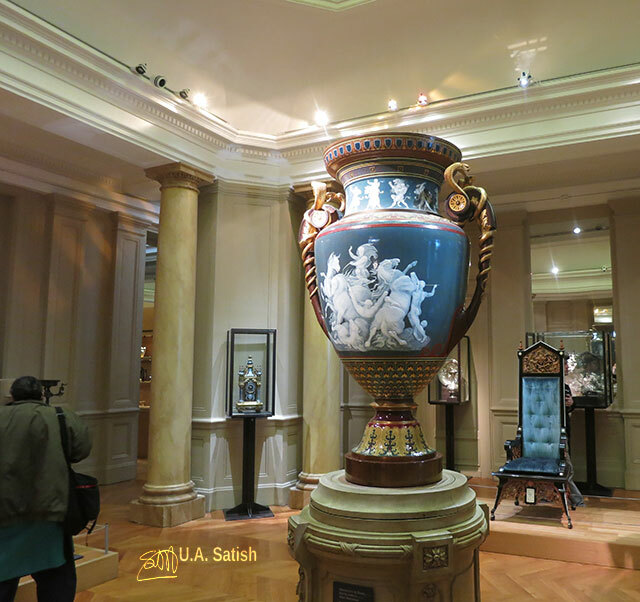 The museum displays French masterpieces including paintings, sculptures, furniture, and photography. Paintings by Cezanne, Monet, Van Gogh, Renoir and Gauguin, to name just a few. are on show. 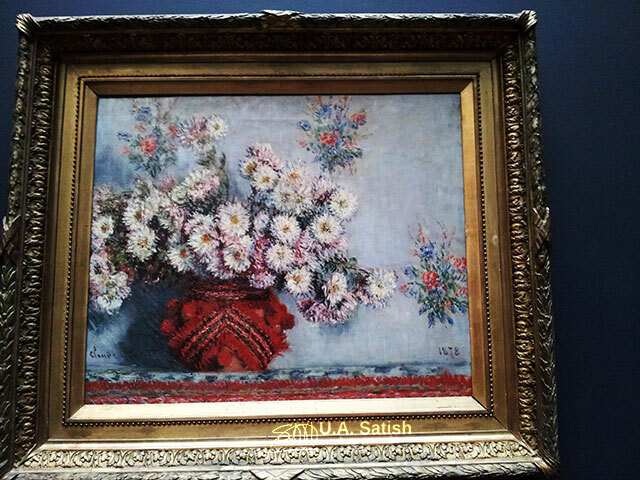 The museum has a collection of 86 paintings by French master Claude Monet. He completed the beautiful oil on canvas painting, Chrysanthemums, in 1878. 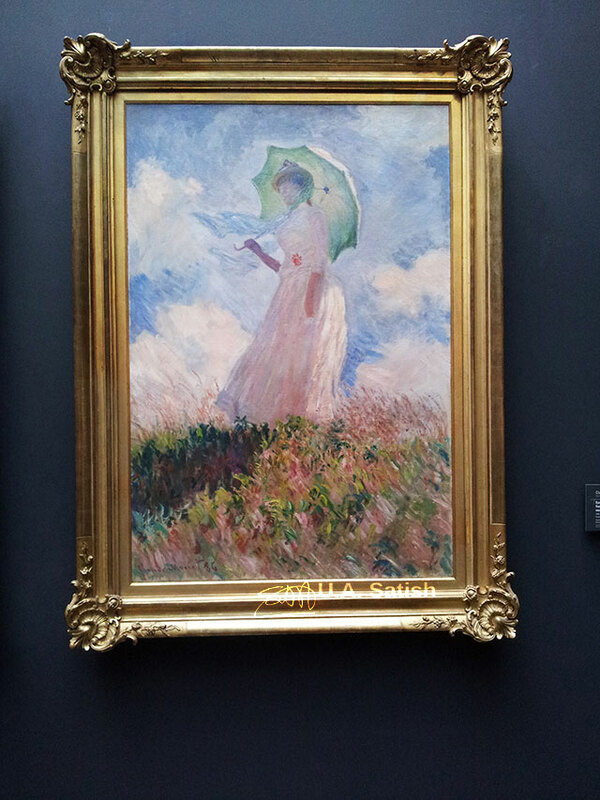 Woman with Parasol is one of the many paintings by Claude Monet in the museum. The woman in the painting is his wife. It is an oil on canvas and dates back to 1886. An old train station houses Musée d’Orsay. The station was set for demolition. But someone had the wonderful idea to turn it into a museum. It is a large beautiful space. Hercules Vase shows Hercules and the horses of Diomede. The vase has a height of about 1 metre. It is made of porcelain with application of paste decoration and patinated with golden bronze. It was created by Albert Dammouse and Charles Lameire, Paris. It is a beautiful clock and has a solid look with intricate designs around it. The clock is in a large open area, at one end of a sculpture gallery. The area is full of natural light. 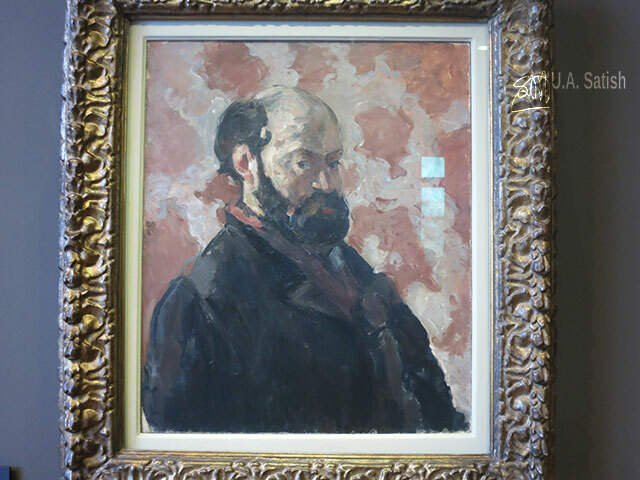 Portrait of the French artist, Paul Cezanne, has a pink background. It is an oil on canvas from 1875. 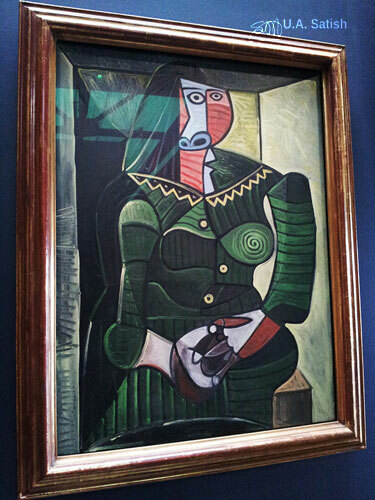 Woman in Green is a famous work by Spanish painter Pablo Picasso. It is a surrealistic painting and dates back to 1943. Between 1878 and 1890, Daniele Lovati ran a large workshop specialising in wood and ivory carving, located in Milan. 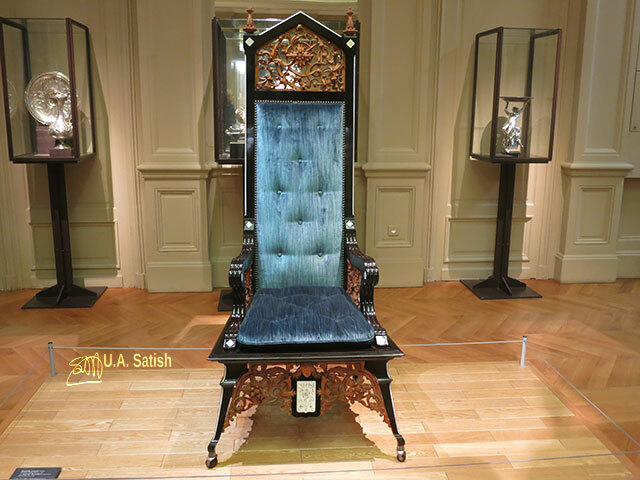 This chair of ivory and ebony on a walnut frame is in Museum d’Orsay. It is believed to have been made in 1880. The huge clock is on the fifth floor of the museum. Behind the clock is a restaurant. 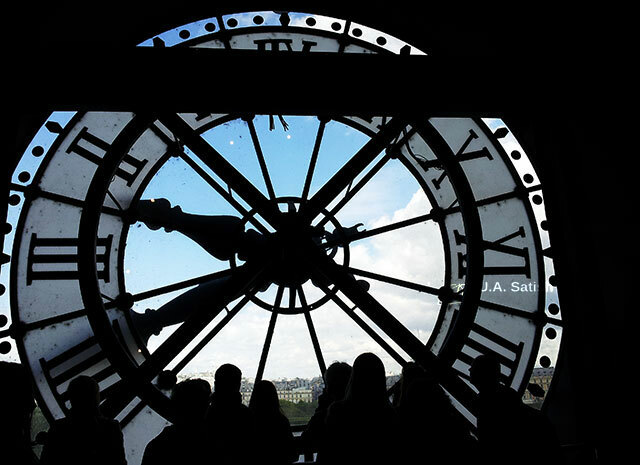 One can look out through the clock face. The museum is open everyday except Monday, from 9:30 am to 6:00 pm. On Thursdays, the museum is open until 9:45 pm and that may be the best time to visit as visitors tend to be much less. 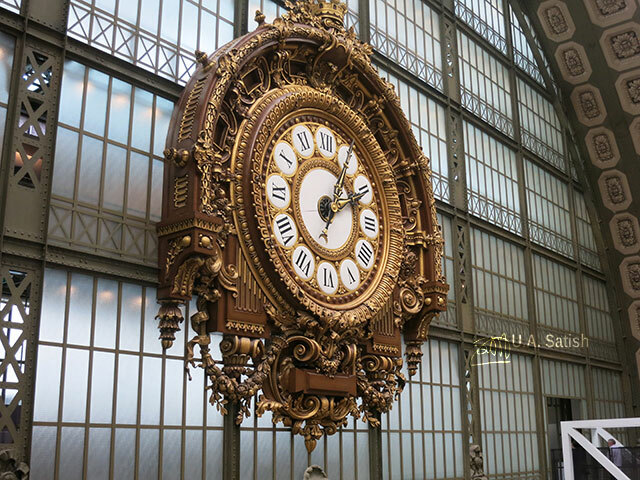 You may have enjoyed my post on Musée d’Orsay in Paris. Join me on Facebook, Instagram and Flickr.